The control mechanisms of topography on alpine treeline pattern are critical to understanding treeline dynamics and future changes. These mechanisms have not been understood quite well enough because of increasing human disturbance and low data resolution. 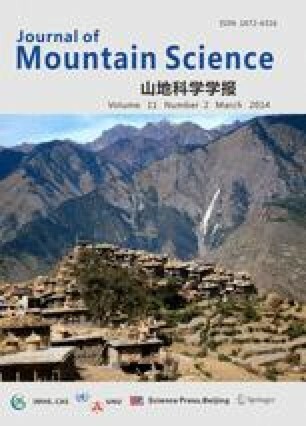 In this study, the relationship between the treeline pattern and topography was analyzed based on high spatial resolution remote sensing data and a digital elevation model in an area in Changbai Mountain with little human disturbance. Future treeline patterns were also predicted. The results showed that (a) aspects with high solar radiation and low snow cover have a high coverage rate of trees, (b) the peak coverage rate of trees switches from low slopes (<5°) to medium slopes (5°∼25°) as the elevation rises because of the extreme environment, (c) the coverage rate of trees is a function that depends on environmental factors controlled by topography, (d) the future treeline pattern is controlled by new temperature mechanisms, new environmental factors and the reallocation effect of topography. Our research implies that topography controls the treeline pattern and changes in the treeline pattern associated with global warming, due to the effect of global warming on environmental factors. This study may well explain the causes of heterogeneous changes in the treeline pattern in the horizontal direction as well as differences in treeline response to climate warming.